Vineet is a first-generation entrepreneur. At age 22 he started his company Magnon from a small shed. Today Magnon is among the largest digital agencies in the subcontinent, and part of the Fortune 500 Omnicom Group. He has led the global top-ten advertising agency TBWA as its India CEO. This made him perhaps the youngest ever CEO of a multinational advertising network in the country. He has won several entrepreneurship and corporate excellence awards, including the Entrepreneur of the Year 2016. He was recently listed among the 100 Most Influential People in India’s Digital Ecosystem. Vineet’s second company talentrack is disrupting the media, entertainment & creative industry in India. It is the fastest-growing online hiring and networ Vineet is a first-generation entrepreneur. At age 22 he started his company Magnon from a small shed. Today Magnon is among the largest digital agencies in the subcontinent, and part of the Fortune 500 Omnicom Group. 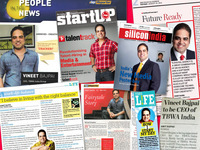 Vineet’s second company talentrack is disrupting the media, entertainment & creative industry in India. It is the fastest-growing online hiring and networking platform for the sector. He has written three bestselling management & inspirational books – Build From Scratch, The Street to the Highway and The 30 Something CEO. He is an avid swimmer, a gaming enthusiast, a bonfire guitarist and a road-trip junkie. He is 39. To ask Vineet Bajpai questions, please sign up. Hello Vineet, I just finished reading Harappa and Pralay. Can you please explain why Vidyut and Naina are kind of falling for each other when Vivasan Pujari and Sanjana have promised each other to be together eternally and cross over together? Such subplots which portray infidelity in the face of assumed true love really bother me as the morality and judgement of the protagonist goes into question. Thank you for writing in. Among the thousands of comments and questions I receive on social media, I can say that yours is the most meaningful. Vidyut and Damini's love is unquestioned. Like you said, it is eternal. But for me it was also important to depict the character of Vidyut to have a little shade of grey, a little human weakness as well. You will note he is determined NOT to fall in love with Naina. Yet he is vulnerable. He is, after all, half-human. Please wait for Kashi. You will find the real answer to your question in it. So happy to hear that you enjoyed both Harappa and Pralay. Please do take out 5 minutes and write reviews for both the books on Amazon or Flipkart. It really helps. Harappa series is a trilogy. Kashi should release in July this year. We’d love your help. Let us know what’s wrong with this preview of KASHI by Vineet Bajpai. "The sequel to Harappa: Curse of the blood river, Pralay is as riveting a read, and leaves you with intrigue on what the next book holds. We’d love your help. Let us know what’s wrong with this preview of PRALAY by Vineet Bajpai. I hope you enjoy the sequel Pralay as well. Please send me your email id to vb@vineetbajpai.com and I will keep you posted personally on its release.
" As the author I cannot pick any one, as I have put my heart and soul into each character. But I would love to see what the readers say. Every characte As the author I cannot pick any one, as I have put my heart and soul into each character. But I would love to see what the readers say. Every character in Harappa is powerful and intense. Let's who becomes the favorite. :-) ...more "